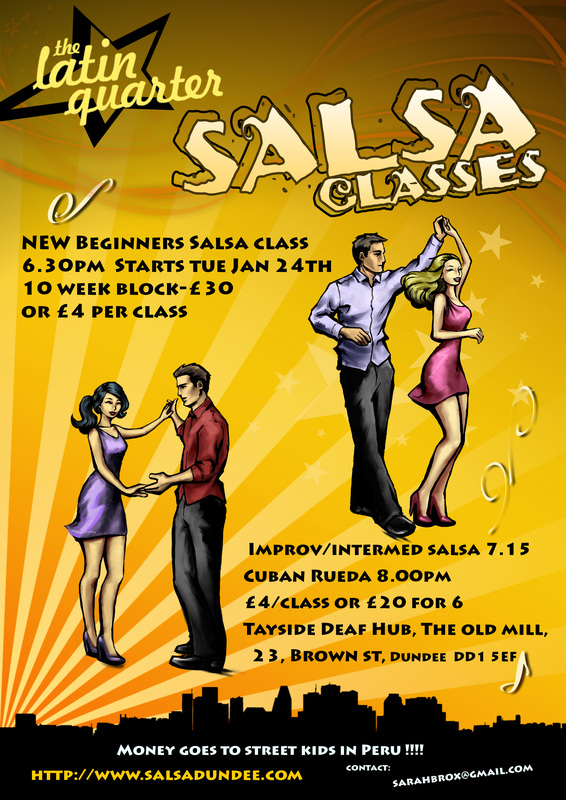 Latin Quarter Tue Salsa classes moving to Tayside Deaf Hub, The Old Mill, 23, Brown St, Dundee DD1 5EF, from 24th Jan.
6.30pm NEW beginners cross body salsa class -10 week block £30 or £4 per class, join first 2 weeks only. 7.15pm Improvers/ Intermediate cross body salsa class. 8.05pm Improvers/ Intermediate Cuban Rueda class. Classes £4 per class or £20 for 6 week pass. Timings are stricter as paying for hall, please come 10 min early to pay & register for Beginners class. To reserve spaces please email sarahbrox@gmail.com. Please pop a poster up if you can to pass the word. Directions: The Tayside Deaf Hub is inside the large ‘Old Mill’ on Marketgait, but you need to enter it from the Brown St side. directions : Go down the street from the Duke’s corner pub to the next block away from Globe pub end, you’ll see the entrance to the Old Mill complex, there are a number of businesses listed on a plaque & a kitchen shop at the entrance. Go inside & drive/ walk along till pass the Crosslane Uni student accom entrance on your Right Hand side, you should then see the Tayside Deaf Hub sign on the right hand side above the door. Once inside go through the cafe area & the room is at the end near there. 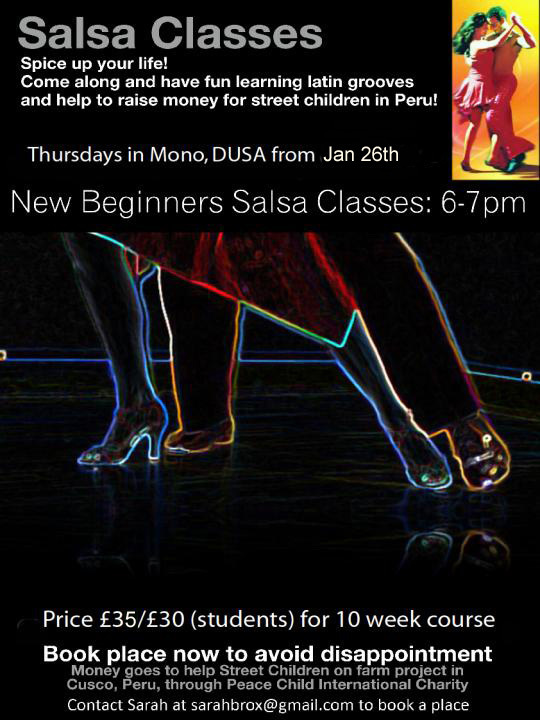 ALSO MONO Salsa Beginners cross body classes start thurs 26th Jan 6-7pm, £30 students, £35 otherwise for 10 week block. Register 10-15 min, can join first 2 weeks only. Classes held in Mono downstairs in Dundee Uni Union on Balfour st. Please pass the word.